Workbasket Wednesday – Scrap Yarn Comfort Shawl – That's StitchTastic! Make Your Life Fantastic One Stitch at a Time! I have a love affair with shawls. Ok. So I have a love affair with just about everything knitting or crocheting. But you have to admit, there is something alluring about a shawl. A shawl can be as simple as a knit garter stitch triangle, or as complex as a geometric design composed entirely of lace. It can be made with any thickness of yarn, for any season, and to go with any outfit. It can be dainty, elegant, and light as a cloud. Or a shawl can simply be a thick, practical, workhorse of a garment. I have made several shawls, and given them as gifts to beloved family and friends. I like to think that by giving my loved ones a shawl, a part of me can be there to wrap them in a big hug and offer love and comfort when they most need it. As much as I love shawls, I have never knit and kept one for myself. 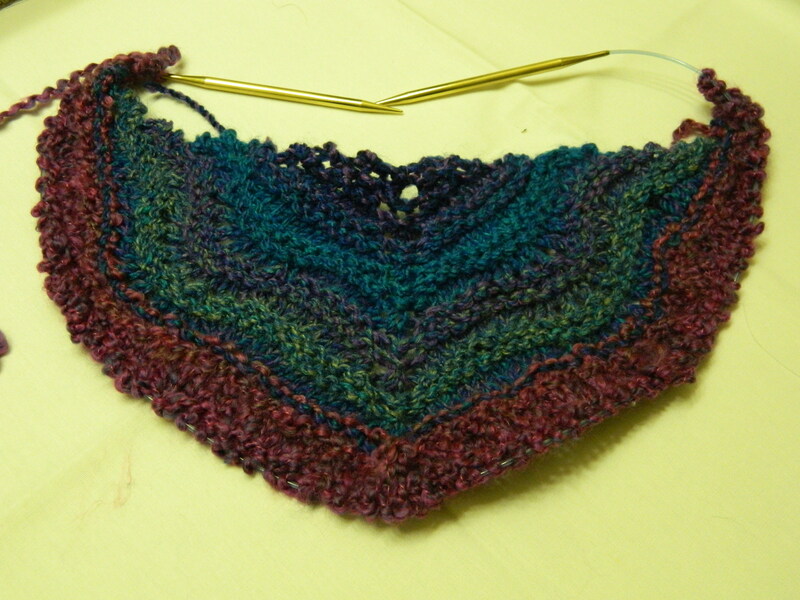 But knitting a shawl for myself has a second motive as well. I currently have 2 bins full of yarn scraps left over from previous projects, that need to be used in some form or fashion. I needed a project that would eat all my scraps. I also love the “Feather and Fan” pattern. And when I saw the Feather and Fan Comfort Shawl pattern on Ravelry I knew it would be perfect! The Feather and Fan Stitch pattern is a fairly basic lace, but when finished leaves a pretty eye pleasing design. 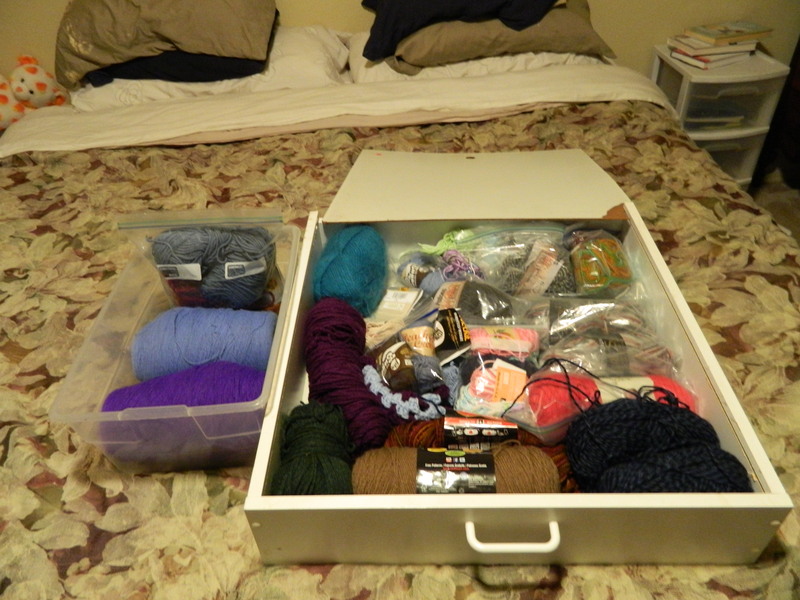 It also accommodates all yarn types and needle sizes. And since this pattern was not written yarn or needle size specific, I can make a custom shawl by simply using what yarn I have in my stash. So I have recently cast on my Scrap Yarn Comfort Shawl, and am only about 60 rows in. But it is beginning to eating my yarn scraps and looking lovely (to me) while doing it. It definitely will be interesting what it ends up looking like after the last stitch is bound off! What are some projects that you have been working on and are waiting patiently to be finished? Or what is a newer project that you just started? They can be anything, Knit, Crochet, Sewn, Quilted, Cross Stitch, anything! I also love knitting shawls. The problem is that there are so many patterns that I want to knit, and not enough hours in the day! That shawl looks like it’s going to be wonderfully comfortable to wear once you’re done. I know what you mean! I have over 65 shawls in my Ravelry Favorites! And I want to add more every day. Oh if only I could knit them all! Thank you for the comment. I love how this yarn feels so I am looking forward to wearing it this next winter. Knitting is a journey – enjoy it.